Andy Serkis has revealed his internet web cam keeps him connected with his family. The actor’s work on blockbusters like Lord Of The Rings and Rise Of The Planet Of The Apes has taken him all over the world – but his brood are never far from his mind. “I’ve had some interesting Skype moments where I’m cooking dinner in the evening, they’re all having breakfast and everyone just wanders off,” he said. Andy – who is father to Ruby, Sonny and Louis with his actress wife Lorraine – has been working in New Zealand as second unit director on The Hobbit alongside Peter Jackson. He admitted the challenge was a daunting one. “It’s a huge responsibility but Peter said, ‘I want you to be bold, go out there and make strong decisions, make it your own’. It’s so vast and we’re shooting in 3D, but I’m working with a crew that I’ve got to know over the last 10 years, so that really helps,” he added. 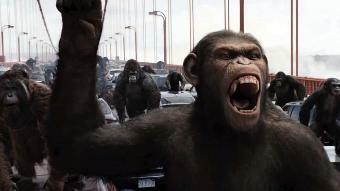 :: Rise Of The Planet Of The Apes is in cinemas now.